Computers have been used in educational environments to carry out applications that need expertise, such as compiling, storing, presentation, and evaluation of information. In some teaching environments that need expert knowledge, capturing and imitating the knowledge of the expert in an artificial environment and utilizing computer systems that have the ability to communicate with people using natural language might reduce the need for the expert and provide fast results. Expert systems are a study area of artificial intelligence and can be defined as computer systems that can approach a problem for which an answer is being sought like an expert and present solution recommendations. In this chapter, the definition of expert systems and their characteristics, information about the expert systems in teaching environments, and especially their utilization in distance education are given. 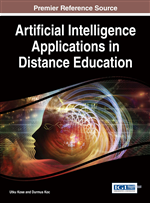 One of the most discussed problems of distance education is whether the learning outputs taken without being in the same place with many students are better than the traditional methods (Miller, 2001). While it is seen in some studies that the results are equivalent, it is true that sometimes limitations occur due to lack of time, place, experts and abundance of students (LaBay & Comm, 2003; Mehlenbacher, et al., 2000; Chatpakkarattana & Khlaisang, 2012). The teachers, who are to get to know students and determine the appropriate type of instruction for them, have a very important role as experts in the success of distance education (Lin, et al., 2005; Wiesner, 2000). As a solution for the lack of experts, systems which can simulate what an expert is doing, which are run to use human knowledge in the solution of problems that can usually be solved with high level capabilities, can be used to lead students in distance education and can be used as assisting systems in compiling data (Russell & Norvig, 2010). The expert systems as an application of artificial intelligence are interactive decision tools that are created on the basis of knowledge gathered from the expert and which utilize information of events and experience to solve complex problems (Baykal & Beyan, 2004). In addition, they are defined as software that models reasoning and decision processes of the one who is an expert on a subject (Nabiyev, 2005). Expert systems, designed to make the logic of a human expert available to others, preserve and transmit individual and collective experiences in specialized domains. They receive, keep and incorporate the experience which certain skilled ones in an organization have accumulated over the span of their professional lifetimes (Wachter & Gupta, 1997). The first expert system known is the writings on Luxor papyrus dated around 3000 BC, found in Egypt, about the application of symptom-treatment-process situations according to “if-then” rules. The expert systems in the real sense of the meaning have been developed by the communities of artificial intelligence in the middle of 1960s with the idea that the combination of some reasoning rules and powerful computers, performance of expert, even superhuman, could be revealed. The first application examples of this period could be expressed as the development of DENDRAL by E.Feigenbaum and afterwards the appearance of MYCIN (Russel & Norvig, 2010; Turban et al., 2007). The goal of the expert system is not to replace any expert; it is to facilitate common use of the expert knowledge by leading it into as many channels as possible. The expert improves himself in problem solving in areas which need special knowledge and becomes an expert on that subject. The expert systems gather all the knowledge about a subject which needs expertise from experts, printed and online sources such as journals, books, articles and store them in the database of the system. When needed, the expert system can deliver this knowledge to any person who wants to use it. Thus, the knowledge of the expert is put into more common use (Erkoç, 2008).